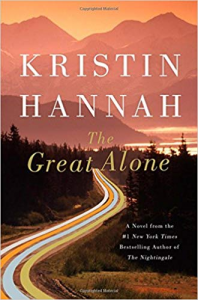 I had not read any of Kristin Hannah’s works before this, but it has been popular, and the location intrigued me: Alaska. It is a coming-of-age novel that is pretty intense. It’s 1974; Leni is 13 and lives in Seattle with her mom, Cora, and her POW father, Ernt. When Ernt learns that he has inherited a cabin in Alaska from an army buddy, he decides to move the family to Alaska. There, everything changes…and nothing changes. The description of Alaska (circa 1974) is compelling in its wildness and the pioneer spirit one had to have in order to survive. We learn, however, that untamed wilderness can be a danger inside as well as outside our own homes. It is a great page-turner—but beware, there are harsh descriptions of domestic violence that may make it tougher for some readers.